Join Marian Milwaukee as they exhibit at this year’s MD&M Minneapolis Show. Stop by and visit from Wednesday, October 31st – Thursday, November 1st in Minneapolis, MN for one of the most anticipated medical tradeshows. Visit us at booth #2238 and see how we can help you with your medical device needs. Get your FREE VIP Expo Pass or discounted Conference Pass to attend this show as our guest. As leaders in the industry, we look forward to discussing our innovative capabilities for skin contact and medical device applications. We’ll have sample pieces to look at, literature to send with you, and material experts to answer any of your questions. 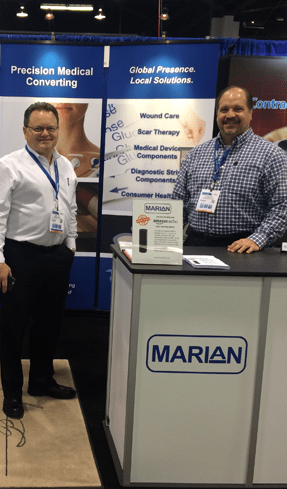 Take a look at this short video about Marian’s medical packaging and converting capabilities. You’ll get a closer look at our clean rooms, FDA registered facility, automated packaging systems, high level quality systems, and more. View the full floor plan and make sure to stop by our booth. We look forward to learning how Marian can help you with your next solution! Register now to save your FREE spot at the 2018 MD&M Minneapolis show and learn more about attending. In the meantime, if you still have questions, contact us and we’ll be happy to get in touch with you. Marian Locations Receive Quality Updates Your Environmentally Friendly Die Cutter – Marian Inc.